Indigo, the blue dye that is created from fermented Indigofera plant leaves, is one of the first dyes discovered by human beings, and was used on everything from garments of Ancient Rome to the original denim fabric developed in France. The magic of Indigo dye is not only its history and hands-on process, but also its range of color, varying from a one-dip pale blue to a twenty-dip dark navy. We love using Indigo dye because of the richness of color, its significance in history, and its ability to change in hue and saturation over time as it is washed and worn. Having read about a 5th generation family of Indigo-dye block printers in a small town in northwest India, in the Fall of 2015 we set out on a bumpy 3-hour drive with three brothers’ first names but no address. We stopped at several tea vendors until one was able to point us down a dirt lane to a small house of natural dyers. There we witnessed the entire family, spanning several generations, quickly and precisely dipping hand-carved blocks into indigo dye baths, stamping yards of fabric and hanging them to dry in the small courtyard out back. We have been working with this family ever since to develop beautiful natural-dyed block-printed designs to incorporate into our collection for IMMODEST COTTON. To create the block printed fabrics that we use in IMMODEST COTTON, the cotton is first printed by hand using a mud-based resist-paste, then dyed using natural indigo, revealing the pattern in white. This technique requires time, practice and patience, and is both a scientific and artistic endeavor. It results in unique variations within the print, enriching the character of each product. 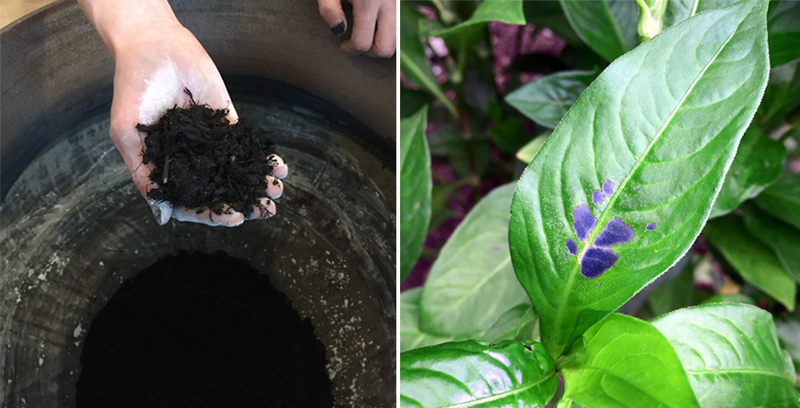 Because we’re pretty obsessed with getting our hands dirty and enjoy the natural dyeing process, we’ve continued to indigo dye here at home. Currently we offer hand-dyed leather handles to use with the East West Tote as well as indigo monogram tags. All pieces are individually dyed locally in Brooklyn in a traditional Japanese Sukumo vat, using fermented leaves from a farm in Tokushima, Japan. Visit our Care + Wear page to learn how to care for your Indigo products.